I’m still on my healthy eating kick to get in shape for the summer, but refuse to resign myself to just baked chicken breasts and steamed broccoli. This recipe was exactly what I needed tonight – something that involves a little bit of real cooking, fresh seafood, and a ton of flavor. I will have to keep this one in mind for the upcoming summer evenings. Peel the shallot and slice crosswise into thin discs, about 3mm thick. Place the sliced shallot, 1 tsp. of olive oil and a pinch of salt in a small skillet and bring to medium heat. Cook the shallot for 5-7 minutes until it has softened, but has not browned. Remove from heat. In a small bowl, combine the cooked shallot and the rest of the ingredients for the salsa. Whisk together with a fork and adjust to taste by adding more honey, vinegar or salt. Wash, trim and steam the french beans. Remove them from the heat before they’re done cooking (still a little crispy) and run them under cold water to halt the cooking process. Set aside to dry. Meanwhile, heat the safflower oil in a large, heavy-bottomed skillet over high heat. I highly recommend you use a cast iron skillet, both for its heat retention and for its natural non-stick nature. Bring the oil just below its smoking point – you should see light whisps of smoke, but not much more than that. Ensure the surface of each scallop is as dry as possible to encourage browning. Place the scallops in the pan, leaving plenty of space between each one. Don’t touch them for 60 seconds – they’re busy forming a golden crust and if you move them, you risk tearing it away. After 60 seconds, lift the edge of one of the scallops to check for brownness. If it is golden brown, flip it over and give it another 90 seconds. If not, let it sit for another 30 seconds. Cooked scallops can still be translucent in the middle, but cook them to a doneness you’re comfortable with. Remove the scallops from the pan and turn of the heat. Toss in the french beans and let them sizzle for about a minute, soaking up the great flavor the scallops have left behind. 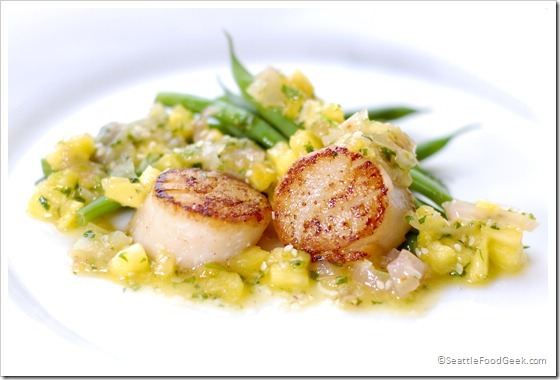 To plate, lay down a pile of beans and divide the scallops between two plates. Top with the salsa mixture, and a little extra sesame seeds, if you so desire. If scallops aren’t your thing, try this recipe with jumbo prawns, calamari, or even grilled octopus! I can’t wait to bring a batch of that salsa to the next cookout and discover what else I can top it on. I just returned from the most wonderful brunch – the kind of meal that has me floating on a chorizo bacon flavored cloud all day long. 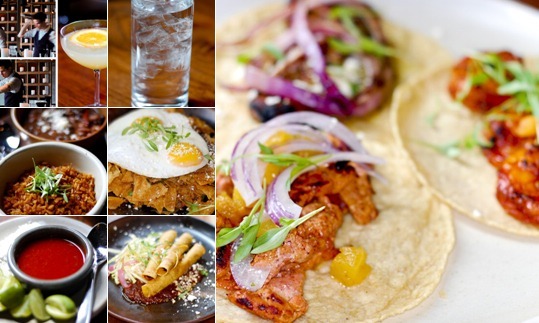 Barrio (Capitol Hill, Bellevue) just launched a weekend brunch menu, and it’s nothing short of fabulous. In addition to a few soon-to-be classic dishes (which we’ll get to in a minute), Barrio’s brunch offers an excellent selection of signature cocktails to kick off your morning. I tried The Bee’s Knees ($8, pictured left) which is a delightful mixture of gin, fireweed honey and lemon. Honestly, I could have put back a whole pitcher of this cool, delicious cocktail. An unusual but welcome item on the cocktail menu, El Borracho ($9), consists of a can of Olympia beer, a shot of tequila, and a hot sauce chaser. I suppose if you really need to erase the night before, it’ll do the trick. But, it was the food at Barrio’s brunch that really blew me away. To start, we sampled a selection of conchas (mexican sweet buns) served with whipped butter. Then we snacked on a duo of salsas ($7), which allowed us to choose 2 out of 6 different generously-portioned salsas served alongside corn chips. Since I’m not much of a fire-breather, I opted for the roasted tomatillo serrano salsa and the grape tomato salsa. Both were richly fresh, with surprisingly complex flavors. They made me sad to think I had ever wasted time eating salsa from a jar, ever. Once I realized what a treat I was in for, I decided to leave my main dish order in the very capable hands of our server. Reading the innocuous menu descriptions, like “Chilaquiles del Dia – tortilla casserole of the day,” vastly understated the caliber of thought and craftsmanship that clearly went into each dish. This morning’s “casserole” was a crunchy, slightly sweet mixture of shredded pork, apples and tortillas, topped with a pair of perfectly cooked eggs and sprinkle of cotija cheese ($10, pictured right). Each bite was heavenly, and only improved by adding a dash of house-made hot sauce, coarse salt and a squeeze of fresh lime. Other must-orders include the cantina potatoes ($3) and the housemade chorizo bacon($3, amazing!). 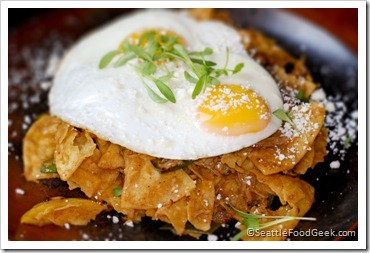 Overall, I was really struck by the superb quality with which Barrio executed brunch. 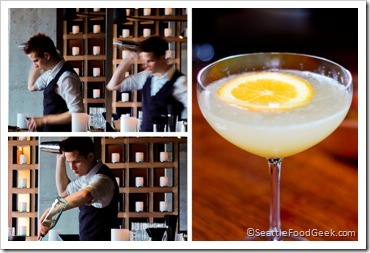 From the clearly passionate kitchen staff, to the professional wait staff, to the bartender, everyone there exuded a commitment to the art of a great dining experience. And nothing speaks louder to Barrio’s commitment to detail than the picture on the left. 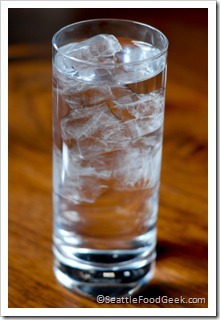 It’s just a glass of water, but if you look closely, you’ll notice that it contains perfectly clear, perfectly square ice cubes. As it turns out, Barrio is one of only two establishments in Washington that uses a state-of-the-art ice maker to produce perfect cubes with a slower melt rate so your drinks aren’t diluted after 5 minutes on the table (the other place that uses this machine is Vessel). It’s a small but telling touch: Barrio isn’t messing around! And with a brunch that, in my opinion, eclipses Peso’s Kitchen, I would make your reservations while you still can. This is the new it spot for weekend mornings!